Our first two days with Ian were wonderful. He was very patient with my decreased mobility due to my bad back – very kind and understanding. He went out of his way to make sure we saw a German cemetery while on our Wicklow tour. Every place we visited was breathtaking and his knowledge and stories were fascinating. I’m just so amazed at what Sean was able to accomplish going back to when my ancestors left Ireland in 1682. 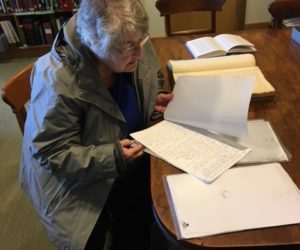 I visited the Quaker Library where I was able to see an original marriage document! 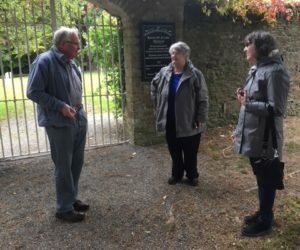 We visited the towns of Mountmellick and Rosenallis where the meeting house and burial ground was located. We were able to talk to two very knowledgeable gentlemen- Roy and Gerald. They were a wealth of information. I was given a very beautiful painting by Pauline Quinn which I just love! None of this would have happened without the patience and communication with Aisling for over a year! Thanks for an AMAZING experience. 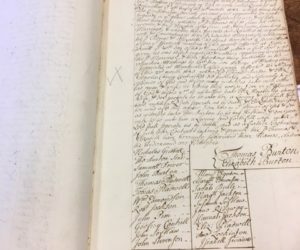 Seeing the old 1682 Original Marriage Document and Wedding List from that time. 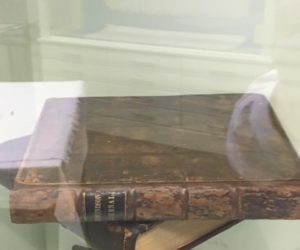 The original Edmundson Journal at the Quaker House in Mountmellick. Visiting the Old Quaker Graveyard at Rosenallis. Debbie’s Journey is not unusual with My Ireland family Heritage clients. We take each story seriously and pride ourselves on delivering The Correct Church & Graveyard the family used on a daily basis from 1600s to 1900s, not just ” The Civil Parish ” found on records. We also take great pride in finding the exact House the family once lived in around the time of the Great Famine 1845-50. In fact we can find your exact house as far back as 1820 substantiated with “Facts”. If you can supply us with a factual document or we find a factual document in our research we can then proceed with a project based on our research.